Here in the Northeast we are covered in about 30+ inches of snow. It’s safe to say I am over the snow. Every day I look out my window to a sea of white. It hinders my view at every stop sign and I have to tether my kids to the back deck before letting them go play for fear I might loose them. It’s seriously a lot of snow. Every morning I wake up and think warm thoughts and remember my days at the beach. Ah… my toes in the warm sand and cool drink in my hand. I must be thinking about those days pretty hard because my daughter said to me today, “mommy I want to go to the beach!” I thought you and me both sister! It is rare that inspiration and money come to me at the same time. But today was my lucky day. We made a trip to the dollar store to get glass gems I want for another project I am dreaming about (you’ll have to wait for that post). While there I saw some glass sea shapes and I thought, “why not? I’ll figure out some way to use them!” We finished up our shopping trip which included some great bargains on plastic storage boxes. We arrived home pretty close to dinner time and of course the girls were asking to watch TV. I knew that late in the day I’d never get them to turn it off to come to the dinner table. 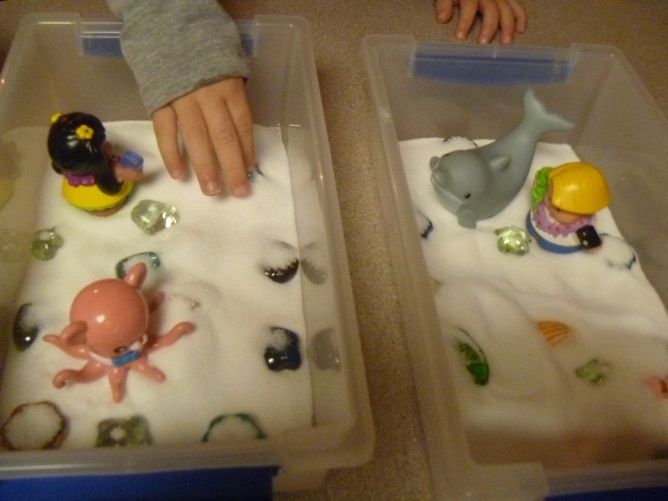 So, I did some quick thinking and just gave them the box with the glass sea shapes to play with. 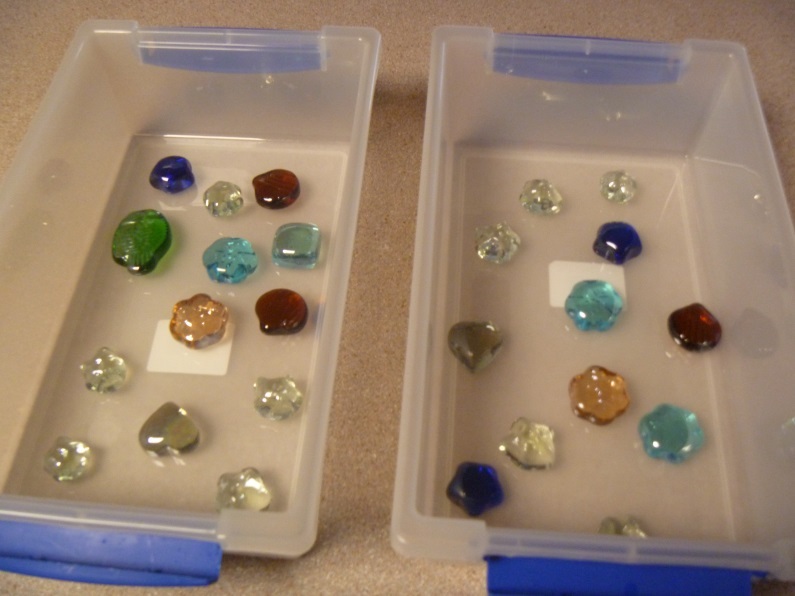 Sea glass shapes in a box. The gems alone were just enough to keep them occupied while I put dinner together. They were so fascinated by the shapes and the smooth side and the bumpy side. 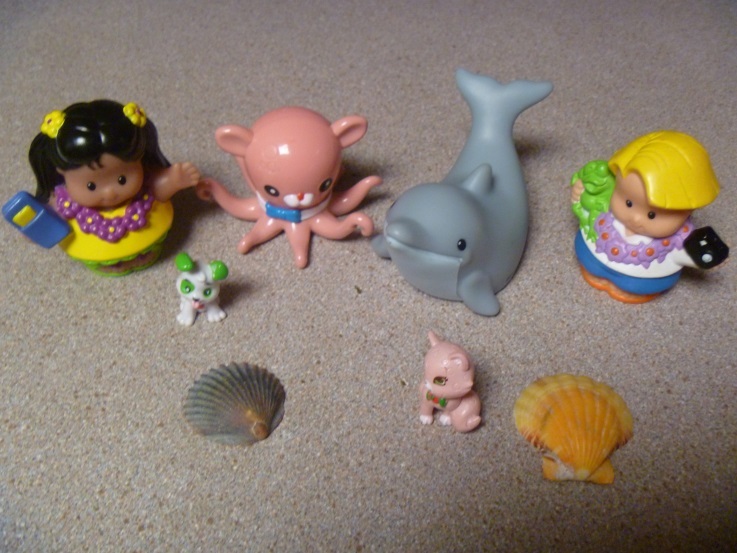 I was so fascinated by no interruptions that I used the time to hunt through their toys to find beach themed items. I let them play until dinner was served and brought the boxes back out after dinner. I asked if they want to help me build a beach in a box. Well, of course! People, animals and things you see at the beach. I tried to include things we might see at the beach. Then we filled it with “sand.” Since I often use whatever I already have on hand I had to wrack my brain a bit for some sand. Then I remembered I had a bunch of salt left over from our salt dough Christmas ornaments. Ta-da! A white sandy beach!! All our beach items in the box. The girls had so much fun with these boxes it was totally quiet for a FULL GLORIOUS HOUR! The only reason they stopped playing is it was time to take a bath and get ready for bed. I will WARN you- this project wasn’t wet or sticky but will get messy when the salt spills outside the box. And it did. A lot. 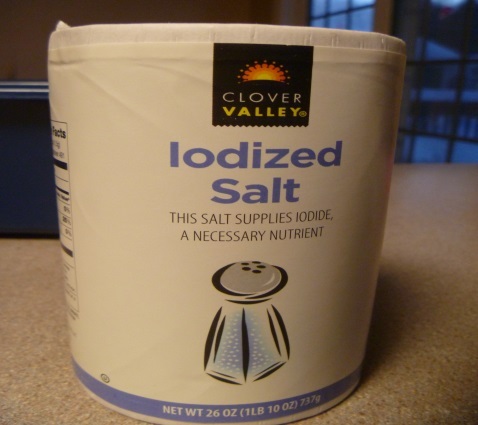 I’d advise against it if you are not in favor of messes entirely, or superstitious about spilling salt. (I had to fight the urge to throw a pinch over my shoulder while sweeping it all up). I’m not going to lie and say my favorite part was seeing the joy on my kid’s faces (that was a bonus), or that it won me some rare quiet time. Honestly, my favorite part was that it only cost me $5.05 total ($2.52 each box). And, I felt pretty awesome coming up with this idea on the fly. So, here’s looking forward to warm sunny days real soon! !